Every year, NZGF runs The Pavs as a celebration of ANZ's best and boldest game development achievements. From digital to tabletop, we aim to the put a spotlight on local games that have gone the extra mile to immerse, entertain and tantalise. The Pavs finalists go in the running for a coveted trophy and are featured in NZGF's week-long games exhibition. Of course, any event named after a dessert wouldn't be complete without a selection of tongue-in-cheek award titles and a cheeky few at our official ceremony. 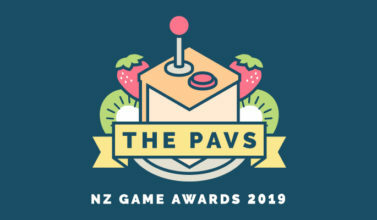 NZ Games Festival culminates in our much-anticipated awards night, The Pavs! Running through the final evening of the festival, the Pavs ceremony brings together accomplished game developers from Australia, New Zealand and beyond to celebrate our industry's talent. Complimentary platters, a tipple or two and incredible networking opportunities are just the start of what the Pavs awards night has to offer. The Pavs have been running since 2016 - when they were known as the Play by Play awards. Throughout the years there's been amazingly tight competition and fantastic entrants. We'd like to continue to showcase those games - click through below to see winners from previous years.